To purchase tickets visit web.ovationtix.com/trs/pr/947968 or call 866.811.4111. Anastasia Olowin and Victoria Frings in Stitches. BOTTOM LINE: Strong acting and writing help to make this a production worth seeing. 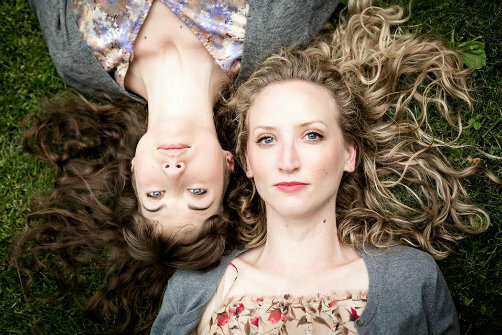 The tense relationship between two sisters who seem to be the exact opposite of one another is the focus of Stitches. The older sister Jill (Victoria Frings) is joyful, hyper, and constantly giggling as her boyfriend Adam (David Kenner) teases her over her quirks. Much of the play consists of Jill and Adam's playfulness as Adam hoists Jill onto his back for a piggyback ride or playfully (it would seem) points out her many childish shortcomings. The two seem to be quite happy until the unexpected arrival of her sister Jane (Anastasia Olowin) who has just been released after being hospitalized for depression-induced cutting. While Jill wears tight bright clothing and blonde curls, Jane is dour with dark hair and loose nondescript clothing. Her very physical presence darkens the otherwise bright stage. Jane agrees to stay with Jill and attend therapy while she attempts to get better and move past her problems. While she tries to piece her life back together she begins to sew a skirt, a task that is a bit arduous as Jill has confiscated all of the sharp objects in the apartment, locking them away in her bedroom. As Jill sews together the skirt it becomes metaphorical for her stitching her life back together. While mental illness and self-harming are topics that could be explored in an overly dramatic fashion, playwright Leah Franqui and director Elena Araoz choose to present them in more nuanced way, with a minimal amount of screams and tears. Franqui’s dialogue is at times sparse, with characters giving just enough allusion to the truth for it to be suggested. The tension between the two sisters is expressed when Jill wordlessly snatches the scissors from Jane and hides them, or stands in rigid apprehension as her sister turns on a sewing machine. When Jill tells Jane to learn to be happy, or to at least learn to pretend to be happy, we see that perhaps her effervescent exterior is a mask. When Adam foists kale upon Jill and dismisses her desire to occasionally eat sugar it becomes emblematic of the problems buried beneath their constantly cheerful demeanor. It is only at the play’s conclusion that the quietly simmering tensions finally bubble to the surface. Much of the success of this production lies in the performances. Olowin in particular shows skill as she portrays mental instability without ever being cloying or over-the-top in her moments of pain. As her foil, Frings’s portrayal of Jill fills the entire stage with her glimmering, giggling personality. During the course of the play I found myself wanting to know a little more about Jane’s back story, but as is, Stitches is a compelling, unique production that creates simmering tension in deceitfully simple domestic moments.